Our oldest is hitting the home stretch of his high school career and last night featured one of what I think will be many landmark events for him over the next few months. In the picture to the left he's receiving a certificate and handshake from the WSFCS Board of Education chair Donny Lambeth. 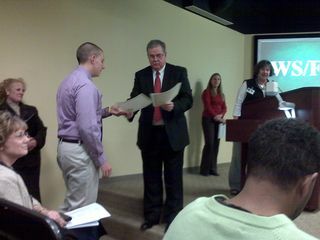 The occassion was the recogntion of Michael and his classmates who participated in the Finance Academy at West Forsyth and East Forsyth High Schools. At the end of his freshman year Michael attended an orientation session about the Finance Academy and he decided then to commit to a three year program that integrates the principles of finance and business with the students' core curriculum. It also provides the students an opportunity to intern at local businesses the summer after their junior year, and last summer Michael was able to intern downtown with the city government. As Chairman Lambeth said last night, the news is full of kids doing the wrong thing, so it's nice to see kids being recognized for doing the right thing. It was definitely a proud moment for Michael's parents. This entry was posted in Family and tagged finance academy, winston-salem forsyth county schools on February 23, 2011 by Jon Lowder.